Tried It Tuesday: Photo cards as "Thank You" notes! 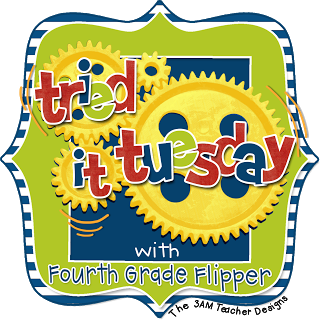 This week, I'm once again linking up with Holly from Fourth Grade Flipper for her Tried it Tuesday linky party! I always get so many great ideas from the other teachers! This is truly one of my favorite and most practical link-ups. Today, I wanted to share a great idea my teaching partner had last year since holiday season is approaching fast. On our team we love how generous our students are during the holidays but writing all the Thank You notes before the end of the day or during plan can make my hand hurt! I see 53 students but we have 100 students on our "team." That means, I could potentially be writing 53+ "Thank You" cards. Plus, the math and science teacher on my team are writing up to 100 Thank You cards during the holiday season... Wowza! So last year, we decided to split the cost of photo holiday cards to give out as Thank Yous. So many sites like Picaboo, Shutterfly, TinyPrints, and Simply to Impress have many different "holiday" options! Even Walgreens has photocards now! Plus, many are offering great deals before December! This year we were able to score a Groupon for Picaboo! For $30 dollars we can get 100 cards. Now, this is more expensive than my One Spot Thank You's, but they are personalized and after splitting the cost - it's less than $10 a teacher! Last year, the homeroom teacher was in charge of writing out a thank you to just her homeroom's students. We all met during plan to collaborate on the notes and make sure we had similar gifts. But then we wrote and signed ONE note from all of us. Students who did not bring in gifts, still got a a holiday card as well on the day before break. This made our lives much easier and the students really seemed like like our Merry & Bright cards. This year, we're going to do a Christmas sweater picture for the kids. Check out some of the photocard sites! Many are offering discounts plus free shipping! Don't forget to also check out RetailMeNot to see if there is a coupon code. It's a an easy want to say "Thanks" without getting a hand cramp! How do you handle "Thank Yous" at the holidays? I LOVE this idea! My bestie next door just bought us a bunch of thank you cards, but I am definitely going to do this next year. I think it's neat that the kids will have a keepsake picture of your team. So very thoughtful! SUPER idea! Love it Amanda! Anything to save time is worth the money to me! Thanks for sharing! Great idea! I'm going to talk to my teaching partner tomorrow! Thanks for sharing! This is a WONDERFUL idea! One of the most stressful parts of that day before Christmas break is writing the thank you notes. No one wants to wait to write pass them out after break but that day is just crazy! Then, there is part about having to take down Christmas decorations. Any ideas there? Haha. I am going to talk to my team tomorrow about this. Thanks! Never the less other than going to standard classes, research has it that you can likewise go to online schools from Essay Thinker where you will likewise have the capacity to get to learning materials whenever of day or night. cara mengatasi dan mencegah gangguan asam lambung. minuman yang dapat menyebabkan asam lambung naik. makanan yang menyebabkan asam lambung naik. makanan yang boleh dimakan penderita asam lambung. I'm thankful for my little "turkeys!" Thanksgiving Must Read: "Bugs for Dinner"
Five for Friday: It really can't be November!